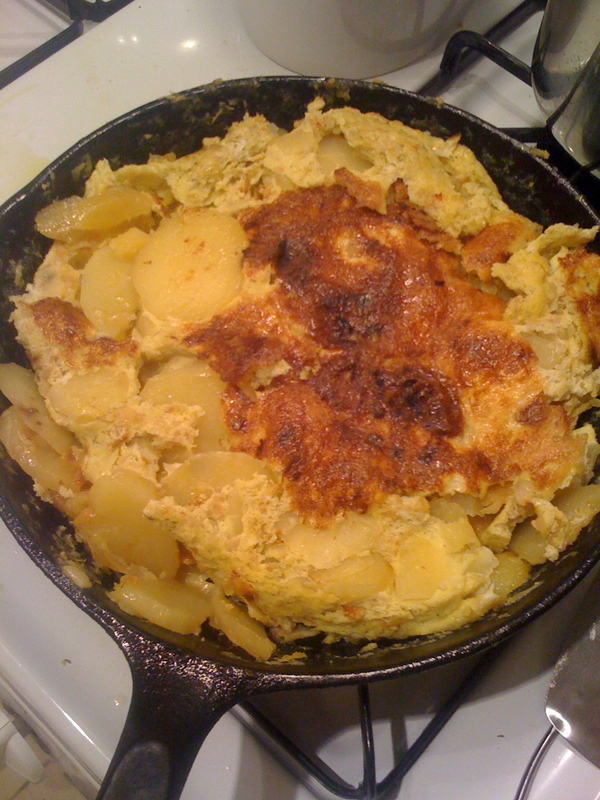 Making a tortilla Española, or Spanish omelette, is not as easy as it looks. Or rather, not on the first try, but maybe the second or third. My friends and I made one Tuesday night for dinner and the results were certainly tasty, but didn’t necessarily come out tidy or resembling a dish you’d serve at a tapas bar in Salamanca. We followed a recipe by Seamus Mullen, whom you might know from the Food Network’s Next Iron Chef, or as the founder of Manhattan’s two Boqueria restaurants. This month Mullen opened a new spot, Tertulia, in the West Village, serving northern Spanish fare like tosta setas and ham croquettes, from morning to night. I like him for his food, but also his heritage: Mullen grew up on an organic farm in Vermont. You’ll notice this recipe calls for a lot of olive oil. This doesn’t actually all end up in the dish, it is drained and reserved for future tortilla making. I recommend, in Step 6, repeating the flipping process one or two times to make sure your tortilla really sets and turns out with well-rounded edges. 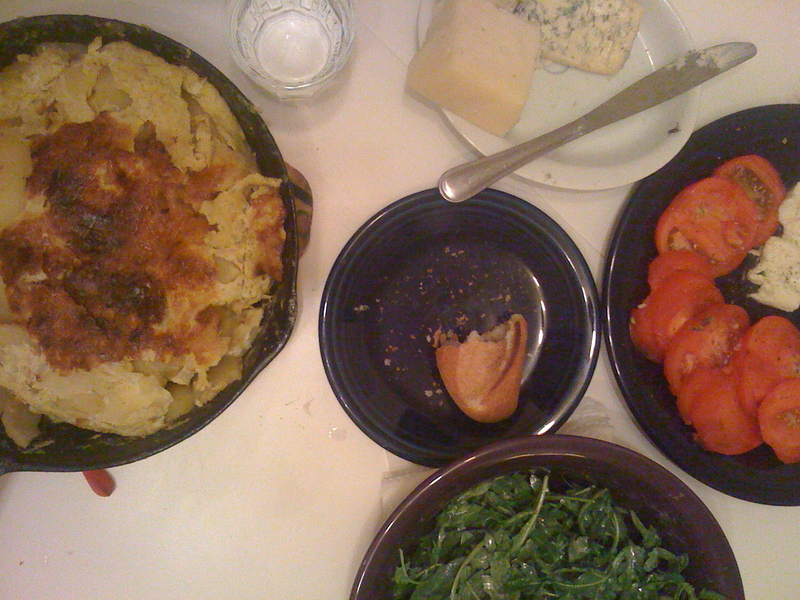 We skipped that and thus our dish came out looking, well, rustic. 1. Lightly beat the eggs and season generously with salt, set aside. 2. In a 10-inch nonstick skillet (I used cast-iron), heat the olive oil over medium-low heat until it’s warm. Add the onion and garlic and gently cook until the onion is translucent, 10-15 minutes. Add the potatoes, cook for 20 minutes until the potatoes are falling apart but not browning. 3. Remove the pan from heat and strain the mixture through a colander, reserving the olive oil for the next time you make a tortilla. After straining the potato-onion mixture, season it with salt and add the eggs, mixing until combined. 4. Heat the same skillet over medium-low heat, adding one tbsp of olive oil from the reserves. Pour the potato-onion mixture into the pan and let it cook for 2 minutes without touching the pan, until the bottom begins to set. Gently shake the pan to release the eggs from the bottom; using a rubber spatula, gently pull the mixture away from the edge to make sure it isn’t sticking at all. Cook until the bottom is set but the top is still very wet, about 5 minutes. 5. Place a large, flat plate on top of the skillet, hold it tightly, and using one quick motion, flip the tortilla onto the plate. I recommend watching this video first. We also had two people doing this step. 6. Wipe the pan with a paper towel, turn the heat back on, add another tbsp of the reserved olive oil and carefully slip the tortilla back into the pan, under-cooked side down, cooking for another 3 minutes. You can repeat this flipping process one or two more times until the tortilla is nice and set, rounded, and golden on the outside. Serve with little sides, like a green salad, a bowl of olives, or sardines on crackers. One of my favorite posts. To me Spanish cooking is one of the most interesting cuisines and the tortilla the true mark of taking simple ingredients and making magic. The only tip i have is to flip it once and then put it in the oven at about 325 so the center sets more, in Spain they like runnier eggs. Thanks Bill! Yes I think I might try putting it in the oven next time. Same with the paella I made last night.